Cocoa is the ingredient of chocolate. In the main producer countries Côte d’Ivoire and Ghana, cocoa production has been responsible for significant forest clearing and encroachment of protected forest areas in the last decades. In comparison to palm oil and soya, cocoa is not responsible today for extensive forest clearing. However, the expected increasing global demand for cocoa, together with a lack of available suitable land, climate change, poor smallholder farmers and low productivity, there is increasing concern of further encroachment into forested areas. Important trading partners from outside Europe in 2017 were: Côte d’Ivoire, Ghana, Nigeria, Cameroon and Peru. 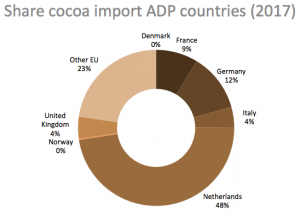 In addition, there is also significant intra-European trade of cocoa beans, paste and butter. The AD-Partnership promotes the uptake of sustainably produced cocoa, for example through certification by voluntary certification standards such as Rainforest Alliance (merged with UTZ Certified) with a cut-off date for deforestation (2005). In Côte d’Ivoire, Rainforest Alliance (RA-SAN + UTZ) certification reached 35% and in Ghana 16%. The second largest cocoa producer in harvested area, Indonesia, only has 5% cocoa area certified. In Nigeria (#4) only 6% was certified. In 2014, cocoa was harvested on 10 million ha (FAOSTAT) and 15% was RA or equivalent certified (Lernoud et al (2017), State of Sustainability Markets). Through the individual AD-countries, we work together with and support the process of the important private sector led Cocoa & Forests Initiative and support various cocoa & forest landscape and supply chain initiatives in the main producer countries. The 2017 Cocoa & Forests Initiative is led by the World Cocoa Foundation and coordinated by IDH Sustainable Trade Initiative and is implemented together with the governments of Côte d’Ivoire and Ghana. CFI brings together 32 companies with a commitment to end deforestation with an initial focus on Côte d’Ivoire and Ghana. These countries published their frameworks for action in 2018. Supported by the UK initiative Partnership for Forests (P4F) the French company Touton together with the Ghana Forestry Commission, the Ghana Cocoa Board (COCOBOD), SNV, AgroEco, the Nature Conservation Research Centre and communities, is working in the Partnership for Productivity, Protection and Resilience in Cocoa Landscapes (3PRCL) in the Juabisco and Bia Districts of Western Ghana. P4F also supports the Partnership for Livelihoods and Forests Landscape Management by Rainforest Alliance, OLAM, the Ghana Forestry Commission and Ghana Cocoa Board. The Partnership is establishing local multi-stakeholder governance mechanism (Landscape Management Boards) to protect the forests and promote sustainable and certified cocoa production within the landscape. The German Gesellschaft für Internationale Zusammenarbeit (GIZ) is also working towards sustainable cocoa and supports cocoa initiatives in Ghana and has a Cocoa Livelihood Program. Amongst others GIZ works on a sustainable cocoa business project in Cameroon, Côte d’Ivoire, Ghana and Nigeria, and GIZ implements the Pro Planteurs project in Côte d’Ivoire. The IDH Sustainable Trade Initiative has defined cocoa as one of their focal commodities and IDH is working on a sustainable landscape initiative near Tai National Park in Nawa Region, Côte d’Ivoire. Another important organisation working on cocoa is Solidaridad, which for example supports Rural Service Delivery Centers in Ghana. The World Cocoa Foundation (WCF) also implements CocoaAction with 12 companies (ADM; Armajaro; Barry Callebaut; Blommer; Cargill; Ecom; Ferrero; Hershey Company; Mars, Incorporated; Mondelēz International; Nestlé; and OLAM). They target 300,000 farmers in Côte d’Ivoire and Ghana and reached 147,000 in 2016. In 2012, ICCO produced the Global Cocoa Agenda, which is a roadmap to a sustainable world cocoa economy. The French chocolate company Cemoi entered into a partnership with the Coffee-Cocoa Board in Côte d’Ivoire. The goal of this partnership is to plant 1.5 million extra cocoa trees to combat deforestation and climate change, thereby safeguarding the livelihoods of cocoa-producing communities. 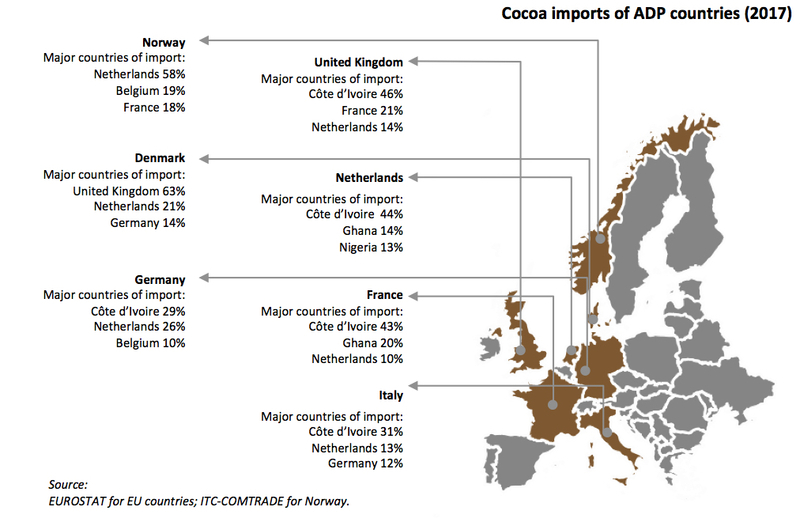 Also various European retailers increasingly source certified cocoa for their private label brands, such as Ahold (Netherlands), Rewe and Lidl (Germany), Sainsbury’s (United Kingdom), Carrefour (France) and Coop (Switzerland).